It's a little too easy to blame the expat mafia. Interesting to get the perspective of another aid worker in Afghanistan, however, I must disagree with some of the premises of your safety advice. I think aid workers here really need to acknowledge that the majority of people killed either by suicide bombers, armed groups, or military (international and national) are Afghans. Afghanistan is by far most dangerous for the Afghans themselves – not for the aid workers. Further, there is a notion that aid workers in this country are people who are interested in noble work for the betterment of humankind – that they are here for selfless reasons, because they believe in democracy, progress, equality, etc. I think this could really not be further from the truth. I think that the vast majority of aid workers are here for career advancement and monetary gains, and thus are willing to take the “risk” of working in Afghanistan. Farah is either reading lines I never wrote (my post doesn’t discuss motivations for working in Afghanistan), or she’s implying that we’re all so mercenary that, hey, maybe those of us who return home in coffins are getting what we deserve for being greedy careerists. If it’s the latter case, she needs to seriously re-examine her own moral code. Also, these same workers are treated like elites – getting driven around everywhere, their homes cleaned, their clothes washed, their meals cooked – all expenses paid. Not every expat lives like this. Many do, sure, but many others do not –or didn’t until recently. I spent my first full year in Afghanistan living in mud houses with only intermittent water and electricity, sleeping on a taushak, cooking my own food and walking to the bazaar by myself. None of my expenses were paid by my employer. I supported myself on a salary roughly equivalent to what I would have made back in the United States. My housemates and most of my expat friends shared in that lifestyle. We refused to live within the Archipelago of Fear. 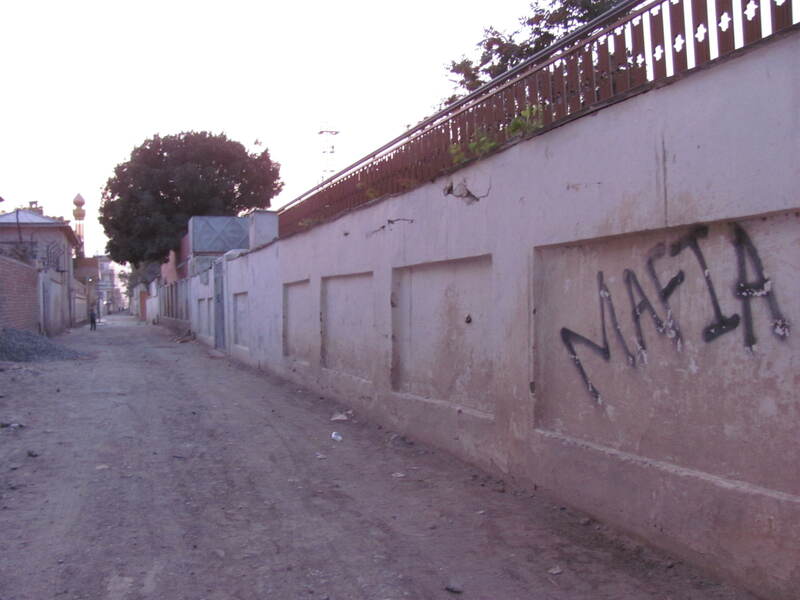 During my second year in Kabul, walking the streets became more difficult. Men threw large stones at me when I refused to answer their catcalls. Teenage boys surrounded me, groped me, and called me vulgar names in Dari. The police began stopping me more and more often just to stare at my passport picture and pass it around to their buddies, humiliating me in front of my Afghan friends and drawing unwanted attention from passersby. Then came the Taliban’s summer offensive, with its midnight gunfire symphonies and suicide bombing assassination campaign. My Afghan friends worried I would be kidnapped, so they advised me to take a taxi whenever I needed to leave my home. I still didn’t have a guard or driver, but I began planning my movements more carefully and carrying a switchblade. There is also the unspoken way expats are engaged with, as if they are the most important people in any situation – their treatment of workers whether they are house cleaners, food delivery workers, drivers, security personal is appalling and would undoubtably be considered racist in their home countries. Whilst I also think that this attitude is really a reflection of the systematic and discriminatory power relations rampant in this country, and reinforced by the international community. Sometimes it feels that the lessons learned by the anti-colonial, anti-racist struggles the world over seem lost on otherwise intelligent, educated “aid workers”, who take no responsibility for their behavior or the elitist treatment they receive citing “security needs” or “that’s just how it is.” Whilst, I am also an aid worker, and also receive this treatment I do my utmost to challenge these norms as much as possible. I also break away from my security “requirements” whenever possible so that I might have a better idea of what this country is like for the majority of its people. I think there needs to be a major change in the attitudes and perceptions of Afghans. International security premises its policies on this idea that every Afghan is a potential threat, which is a really impoverished way to approach the immensely important work and potential present here. I think aid workers should reassess why they are in Afghanistan, and structure their lives/work not around their personal security – but around the potential to make a significant impact on the lives of a people who have suffered 30 years of war. Perhaps, this is best done first by listening. That said, the security situation in Kabul and elsewhere is very bad now, and worsening by the week. That’s not Chicken Little squawking — that’s an irrefutable fact. 2012 will be my third year in Afghanistan, and almost certainly my last. I won’t be able to live my freewheeling lifestyle anymore. My days of picnics in Kapisa and damboora nights at Qargha are over. This year, I will have to live in a formal guesthouse with a guard, or in a hotel. I won’t be doing much walking outside, if any at all, and I certainly won’t go strolling alone, even in the Kabul neighborhoods I’ve come to know so well I could navigate them with my eyes closed. I’ll continue taking the roads in civilian vehicles as long as I can, because the fear I feel clawing into my ribs when I’m winding my way through the narrow valley highway between Kabul and Jalalabad keeps me honest, connects me to my colleagues, and saves thousands of dollars that could be –and are– better spent on project beneficiaries. But going “low profile” and eschewing the typical security measures of armored cars and chartered flights between cities is not risk-free, cost-free or always the more ethical choice. If I take the roads, even while hidden under a burqa, I risk the lives of the Afghans traveling with me. If we are stopped at a Taliban checkpoint and my identity is revealed, I’ll mostly likely be kidnapped, but the Afghans with me will be summarily executed. If I live in an ordinary house in an Afghan neighborhood, instead of an expat compound, I plant a target in my innocent neighbors’ midst. With my mere presence, I knowingly run the chance of drawing evil men onto the streets where their children fly kites. In a morally muddled conflict like Afghanistan’s, the ‘right thing’ is seldom obvious, and, in my experience, expats –aid workers and others– are usually left with no truly good options.